IP67 Waterproof / Sandproof / also FLOATS! 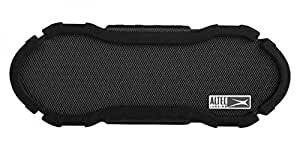 Experience superb room-filling sound with the all new Altec Lansing Mini Boom Jacket Bluetooth Speaker. Featuring an Omni-directional design, this speaker wirelessly delivers high performance audio over a 50 ft. range via the dual 1.5â full range neodymium drivers. Stream your favorite tunes and answer your phone calls instantly with the built-in Bluetooth technology. Certified iP67 rated, this speaker is sand proof, dust proof, and waterproof, making it perfect for indoor or outdoor parties. It also boasts a built-in battery that can play your music for up to 16 hours! The fun doesnât stop there as this powerful sound system comes built with a power bank, allowing you to charge your device and play your favorite jams at the same time.